This property is directly associated with a crucial period (1950-1966) during which downtown commercial redevelopment began to occur after nearly thirty years of stagnation as several major modern municipal government and commercial buildings were constructed. However, compared with massive post-war suburban real estate development, relatively few new buildings were constructed in downtown Seattle until the late 1950s. Major modern construction included the Public Safety Building (1951, destroyed), Seattle Public Library (1956-59, destroyed) and the Municipal Building (1959-61, destroyed), as well as the expansions of the two major downtown department stores. Scattered major commercial construction included several notable extant buildings that reflect modern zoning changes and architectural trends including: the Norton Building (1958); the Logan Building (1959); the Washington Building (1960) and the IBM Building (1961-64). The Seattle World’s Fair - Century 21 Exposition was held in 1962 and triggered the remodeling of older buildings and the construction of the monorail, and tourist-oriented restaurants and motels. Throughout this era older buildings were demolished to make way for surface parking lots and garages and for interstate freeway construction. The Federal Reserve Bank of San Francisco was designed by the Seattle architecture firm Naramore, Bain, Brady, and Johanson (NBBJ) in 1949. William James Bain, Sr. (1896-1985) began his architectural education in 1915 as an apprentice for W.R.B. Wilcox, Arthur Lovelace and other Seattle architects. After serving in France during WWI he enrolled at the University of Pennsylvania and obtained an architecture degree. He returned to Seattle where his practiced for himself and in several partnerships with others – including Lionel Pries – primarily designing residences, apartment and sorority houses. From 1941 to 1943, he worked with J. Lister Holmes and others on Yesler Terrace, an innovative low-income housing project. In 1943, he joined with architects Floyd Naramore, Clifton Brady and Perry Johanson to form Naramore, Bain, Brady & Johanson in order to handle several large government projects during WWII. Now known as NBBJ, the partnership went on to design a wide variety of commercial, industrial and institutional buildings for which they have an earned considerable local, national, and even international prominence and attention. The six-story building was designed in the modern style with a sandstone exterior and emphasis on function and form rather than exterior embellishments. NBBJ was the leading local architecture firm during this era and were responsible for the design of the new U.S. Post Office (1959) as well as major additions (Washington Athletic Club, Spring Apartment Hotel, Securities Building) and remodeling efforts (YWCA) involving historic downtown properties. Prior to its construction, this building site was occupied by the Rialto Building. The Rialto Building (1894, destroyed) housed the Frederick and Nelson Department Store, which was one of several major retail enterprises that gradually made Second Avenue a fashionable shopping district, including the Bon Marche Store (1896, 1902, 1911, destroyed) at the SW corner of Second Avenue and Pike Street and the extant Stone, Fisher & Lane Store (Galland Building, 1906). After Frederick’s moved to a new store building constructed at Fifth Avenue and Pine Street in 1918, the Rialto Building continued to be used for some retail purposes, but was damaged by fire in 1929. It was sold to the Federal Reserve Bank of San Francisco in 1945 for $250,000 and then torn down in March of 1949 in order construct a modern banking facility on the site. The Federal Reserve System is the central bank of the United States. Congress created the Federal Reserve through a law passed in 1913 in order to serve as a lender-of-last-resort in times of crisis and to provide a national currency that would expand and contract as needed. Essentially the evolution of “the Fed” began with the Banking Panic of 1907 and after years of debate and several proposals made for banking reform, the Federal Reserve Act was passed, considered to be the most radical banking reform in the country’s history. Since its establishment, the Federal Reserve system has evolved from a sound banking system designed to prevent banking panics and foster a healthy economy, into what came to be known as a central bank and an active promoter of overall monetary stability and a multi-faceted player in the financial services industry. The Federal Reserve Bank of San Francisco is one of twelve Federal Reserve Banks nationwide, each serving a specific region of the country that in turn work with a seven-member Federal Reserve Board of Governors in Washington D.C. to coordinate policy. The Seattle office is one of six that work under the San Francisco branch of the Federal Reserve Bank to serve the expansive Twelfth Federal Reserve District that includes not only the nine western states--Alaska, Arizona, California, Hawaii, Idaho, Nevada, Oregon, Utah, and Washington--but also three U.S. territories--Guam, American Samoa, and the Northern Mariana Islands.. This is the largest of all the U.S. districts covering 36 percent of the nation's landmass, ranking first in the size of its economy, and is home to approximately 20 percent of the nation's population. This Federal Reserve branch bank is located in the financial district that evolved along Second Avenue in the early twentieth century in tandem with the above noted major retail enterprises. During the post-fire era and the earliest years of the twentieth century, the headquarters of the major banking enterprises were clustered near First Avenue and Yesler Way or along the southern end of Second Avenue near Yesler Way. However, by 1912 nearly all of the major banks and financial institutions were headquartered at locations along Second Avenue near Marion and Madison Streets. By the mid-1920s, the financial district was well-established at this location as banks and other financial institutions continued to construct or occupy portions of large commercial office buildings as well as smaller scale buildings devoted entirely to banking operations, including; the Scandinavian American Bank (Alaska Building, 1904); Seattle Trust and Savings Bank (1910, 1922); Seattle National Bank (1910); National Bank of Commerce (Baillargeon Building, remodeled 1918); Union Savings and Trust Co. (Hoge Building, 1911); the Dexter Horton (Seattle First National Bank) Building (1922); and the Bank of California (1923-24). 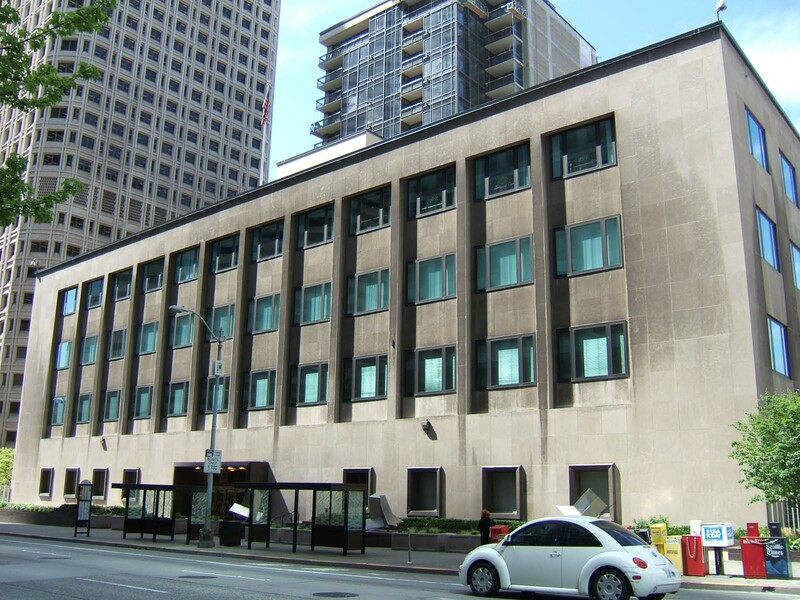 Prior to the construction of this modern facility, the Federal Reserve Bank was housed, beginning in 1913, in leased upper floor level offices in the nearby Baillargeon Building at Second Avenue and Spring Street. As the size and role of the bank’s operations grew, the need for a large building resulted in the construction of this modern banking institution. The Federal Reserve Bank is a well- preserved example of an important downtown banking institution property type. It is a notable example of post-war modern architectural design and one of only seven extant downtown buildings dating from this era. It was designed during the early years of the partnership of a highly notable local architecture firm, Naramore, Bain, Brady, and Johanson. Located along the entire west side of Second Avenue between Madison and Spring Streets, this four-story building was designed to serve as a federal reserve bank, purposes for which it continues to be used. The site covers an entire half block and the building measures 248’ x 126’ and includes a reinforced concrete foundation and basement. It exhibits a modern enframed block façade composition and is designed in a minimal modern architectural design mode. The reinforced concrete structure is clad with smooth light grey-color stone. The Second Avenue façade is set back from the street by a long narrow plaza. It is distinguished by 12 prominent three-story window bays extending vertically from the second floor level. Each bay is deeply inset with flush windows and spandrels at each floor level. The window bays are enframed by piers that are flush with the south and north end walls and the first floor level wall. The first floor level is composed of a central recessed entry way flanked to each side by four windows that correspond with the outer four upper floor level bays. The first floor level windows are individually set in square openings, flush with the cladding and simply trimmed with a red-black granite. The same granite is used at the entry surround, planters and sculpture bases in the plaza area. The south and north elevations have a different fenestration pattern with untrimmed individual windows set in a plane that is flush with the cladding. The roof is simply capped by a narrow metal coping. The entry includes sets of bronze entry doors that are surmounted by a transom light and the building name in bronze letters. The windows at all elevations appear to be a modern aluminum product with a slightly different muntin and mullion configuration than the original members. The building is not open to the general public. The lobby appears to include distinctive travertine flooring and wall cladding and fluted bronze elevator doors. Additional field investigation is required to determine if there are other intact or architecturally significant interior building features or finishes. Seattle Monorail Greenline EIS - Historic Resource Form prepared by ENTRIX (2003).